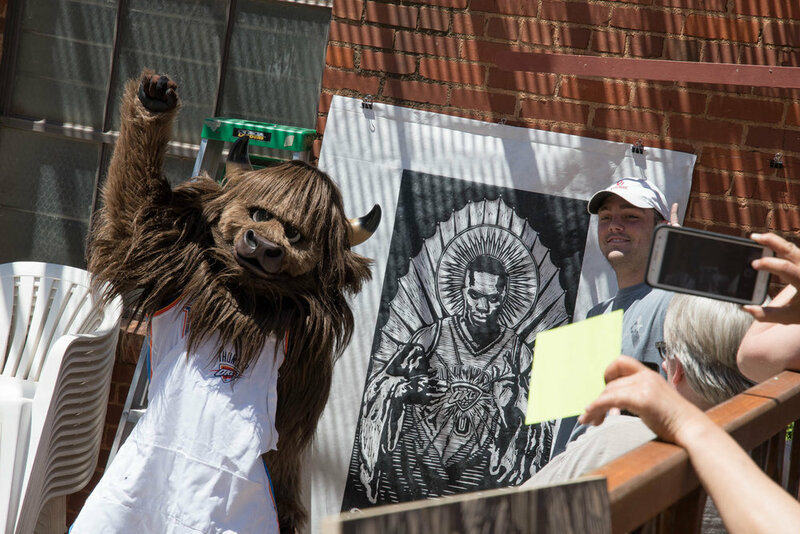 The Steamroller Festival at Artspace at Untitled brings the community together through printmaking, family activities, live music, and local flavor! The yearly one-day festival features the printing of large-scale wood blocks, which have been carved by artists leading up to the festival, and printed on Tyvek with a 5 ton steamroller on the day of the event. This festival is a means of collaboration for people of all ages – young children, high school students, artists, and the general public. Thank you to everyone who joined us on Saturday, April 28th from 10am-6pm for our 2018 free printmaking festival in the Deep Deuce district of Oklahoma City! The festival activities, which included artist demonstrations, live performances, food trucks, kids and family activities, pop up shops from 10am-4pm, and more, were held indoors and outdoors at Artspace followed by a performance by Jabee for April's Deep Deuce Sessions live music event at 7pm in our garden, which was also free & open to the public. Over 100 local and regional artists participated in the main attraction of the festival and printed their woodblocks with a steamroller festival all day during the event! In addition, 22 artists were selected for this year's woodblock exhibition in our gallery space which opened with a reception on Thursday, April 26th from 5-8pm. Proceeds from the print sales are going towards sustaining the print studio & its programming. The first steamroller festival held at Untitled in 2013 brought over 100 visitors to Deep Deuce with no advertising. In 2017, we reached out to local businesses and organizations to help us host a Cinco de Mayo mixology party the night before the festival, which featured live music, a meet & greet with the Big Ink artists, and food & drink from some of Oklahoma City's best establishments. With the help of our amazing artists, volunteers, sponsors and collaborators we were able to produce an all-day festival where over 60 artists we able to print and display their work, including high school students from our Mentorship Program, college students and artists from across the state and region. Our hope is to grow the festival into an annual event that spans across multiple locations in the Deep Deuce neighborhood and draws people in from all over Oklahoma City and the state. Press play for a quick look at our second Steamroller Festival that was held in partnership with BIG INK on May 5th, 2017.